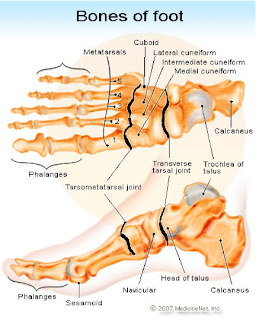 The 24 bones in the feet are ‘kept’ together by how they fit ‘into each other’ and by ligaments. The muscles and plantar fascia provide secondary support. Fat pads help with weight bearing and absorb impact. As the foot strikes the ground, this force unlocks the bones in the feet, which are then able to adapt to any surface. Imagine, if this bony structure was rigid the effect it would have on our legs and the rest of our body. As the foot rests on the ground and carries the full weight of our body, it becomes rigid and is ‘held together’ to support weight and propel the foot off the ground to repeat the cycle. Pain in the foot is a sign there is either an internal or an external problem. If nothing is done about it, it may worsen the source of it, and body movement is adjusted to compensate for the pain, which then affects ankle, knee, hip and even shoulder joints creating new problems. Strong muscles stabilize the foot and support movement. Exercise helps those muscles to be strong so the foot moves freely. Months and years of muscle weakness will affect not only the health of your feet but also your posture. Before getting out of bed in the morning point the toes towards the end of the bed and then back up towards the ceiling. Do this a few times, and then rotate them clockwise and anticlockwise a few times. These movements stretch the various tendons and muscles and also increase blood flow before putting weight on the feet. This is very helpful for plantar fasciitis. Whilst brushing your teeth lift your heels off the floor as high as you can, then down again, repeat several times. further out lifting the arch off the floor. 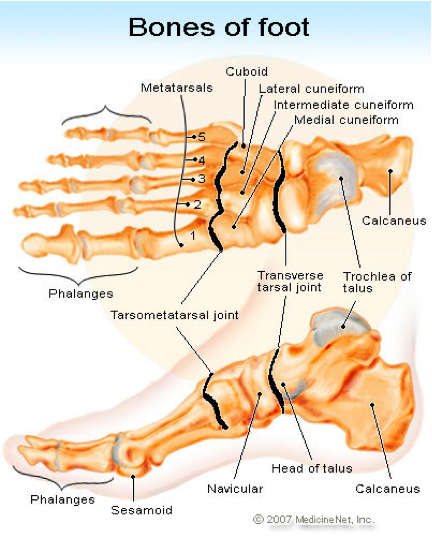 This strengthens the arch of the foot. Balance on one foot, this exercises and strengthens the small muscles. Whilst sitting, roll a tennis ball from your toes to the heel whilst applying as much pressure as is comfortable, this massages the tendons and muscles in the sole of the foot. Reflexology works the reflection of the body on the feet. Doing this, fingers prod, poke and massage the muscles and the tendons as well. This increases circulation and softens muscles and tendons. Feet benefit from FMT and Reflexology, even healthy ones. The gentle FMT movements restore mobility and function and reduce pain in a stiff joint and associated tissue. The gentle movements create space between the 24 bones, which helps dissolve deposits between the bones. Reflexology, through the prodding and poking, increases blood and fluid flow reducing pain and inflammation. Jedynak, T. (2007). Foot Mobilisation techniques (FMT) for Reflexologists. Course material. Jedynak, T. (2012). An introduction to the principles of foot mobilisation techniques. Podiatry Now.